This slow cooker chili is a blend of beef, beans, tomatoes and spices, all simmered together in the crock pot for a rich and hearty dish. 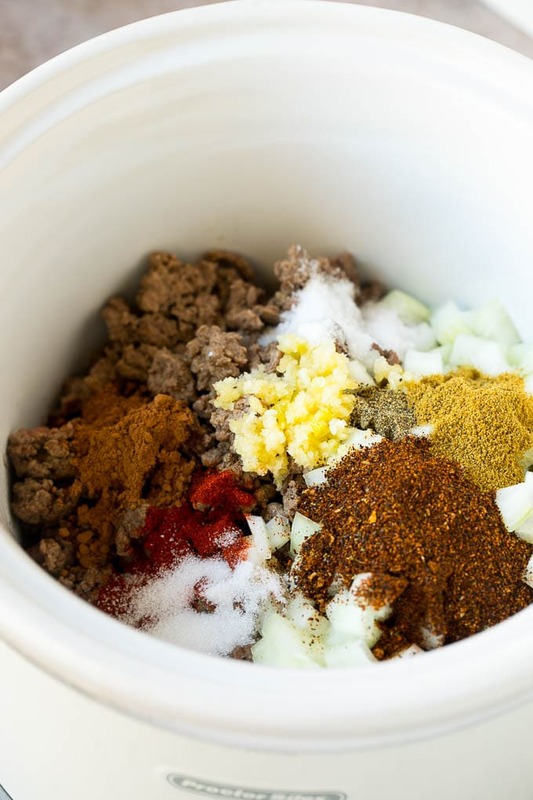 Crock pot chili is perfect for parties and any occasion where you need to feed a crowd! If you’re a chili fan, you’re in the right place. This slow cooker chili is the best I’ve ever had. 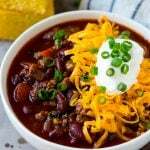 Looking for more chili ideas? 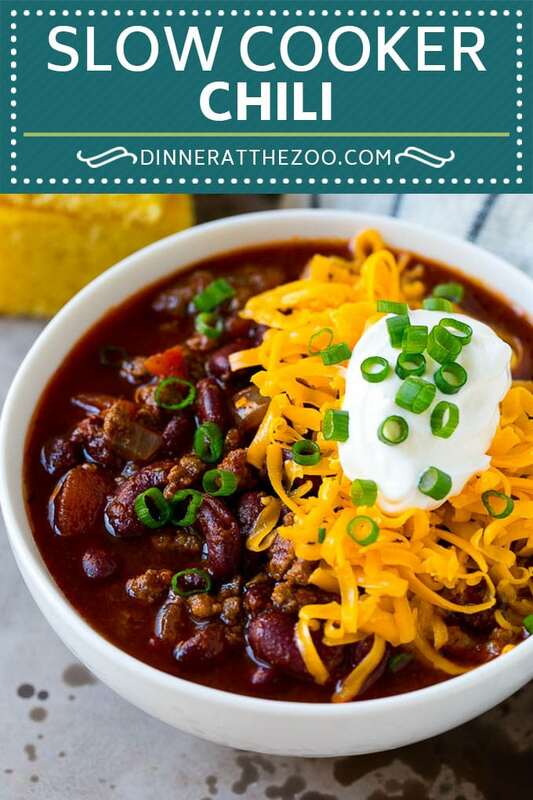 Don’t miss my comprehensive list of 75 slow cooker chili recipes! There’s nothing like a good bowl of chili. There are so many different ways to make chili, but this slow cooker chili is about as classic as it gets. This recipe makes a big batch, which means it’s great for a party, or you can freeze some for another night! How do you make slow cooker chili? The first step in making this chili is to brown your ground beef. The beef needs to be at least partially cooked before it goes into the slow cooker so that it won’t all stick together in one big clump. The rest of the ingredients including onions, garlic, tomatoes, tomato sauce, spices, and beef broth go into the pot, then it’s time to let everything simmer away! I use 90% lean ground beef. It’s got plenty of flavor without all the extra grease. I pre-measure my spices the night before, which makes prep time go a lot quicker when I’m trying to get everything in the slow cooker in the morning. This recipe makes for great leftovers and meal prep. It can be stored in the fridge for up to 4 days, or in the freezer for up to one month. 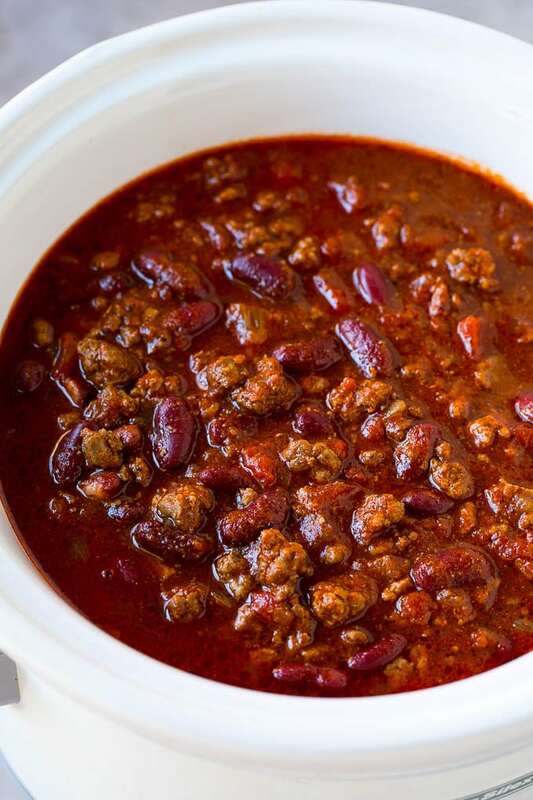 Serve your chili with plenty of toppings such as grated cheese, sour cream, onions, tomato or even bacon crumbles. While this is a classic version of chili, there are many ways to customize it to your tastes. Turkey: Use ground turkey instead of the beef. Beanless: Use 2 1/2 pounds ground beef and omit the beans. Spicy: Add 1-2 tablespoons of hot sauce to taste. 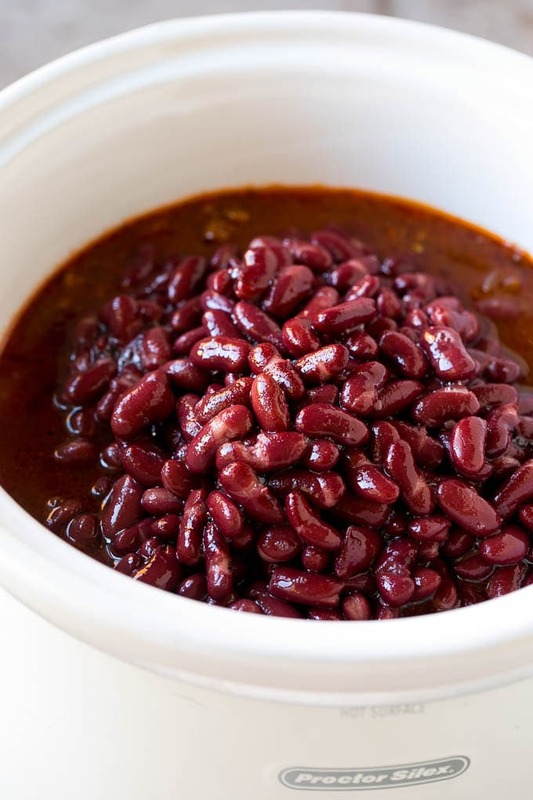 Three Bean: Use a total of 3 1/2 cups of black beans, pinto beans and kidney beans. Meat Lovers: Use 2 1/2 lbs of cubed and browned stew meat instead of the ground beef. If you don’t want to wait for your chili to simmer all day in the crock pot, you can make this recipe on the stove instead. Simply brown the meat and onions, then add the rest of the ingredients and simmer over low heat for one hour. Cornbread is the classic side dish for chili, and my honey cornbread recipe is the best of the best! Other great options include garlic knots or cheese bombs. This chili is also great served over a baked potato, on a hot dog, or poured over french fries. 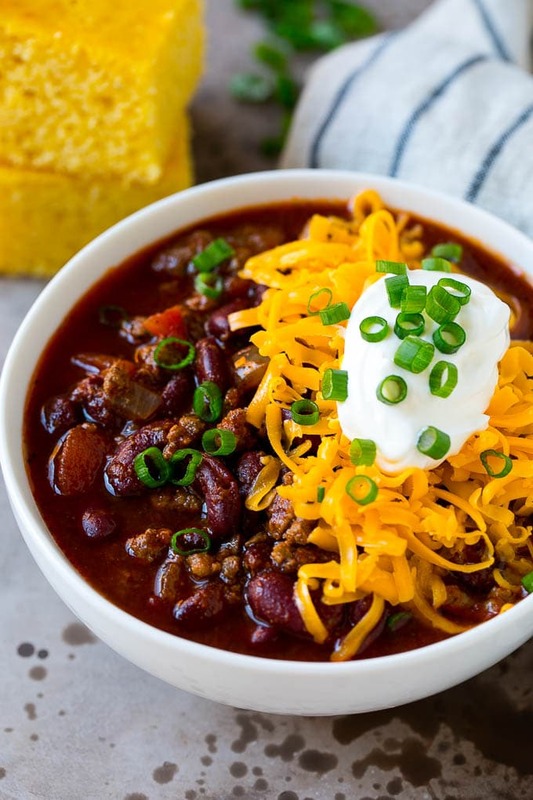 There are so many different ways to enjoy chili and you just can’t go wrong! Heat the olive oil in a large pan over medium high heat. Add the beef and season with 1 teaspoon salt and 1/2 teaspoon pepper. Cook, breaking up the meat with a spoon, until beef is browned and cooked through. 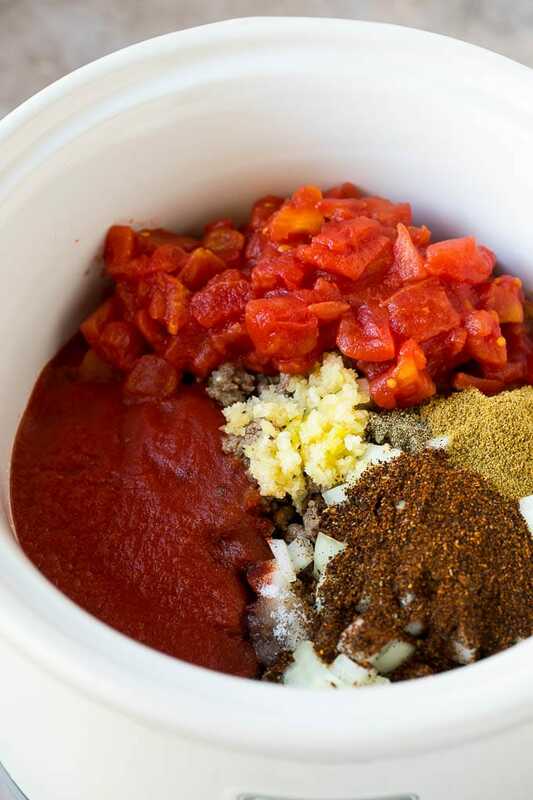 Place the ground beef in the slow cooker along with the onion, garlic, tomatoes, tomato sauce, beef broth, chili powder, cumin, smoked paprika, cocoa powder, sugar and remaining 1/2 teaspoon salt. Stir to combine, then cover and cook on low for 6 hours or high for 3 hours. Add the beans and cook for an additional 20 minutes until beans are warmed through. Serve immediately. This recipe looks really delish and tasty. I will definitely try this recipe for my family. That look a mouthwatering and healthy recipe. I would love to prepare them. We love to eat chili and are always looking for new recipes. This looks like a delicious meal. I’ve never seen cocoa powder used in chili before; I bet that adds a sweet kick! My husband usually makes the chili in our home; I’m going to share this with him! You just can’t beat a slow cooker chili sometimes. It is such a hearty and warm dish for the whole family. Chili is one of my favorite comfort foods. Cooking in a slow cooker is a wonderful idea. I look forward to making this! Chili is my family’s favorite dish. I often make it in the slow cooker. Yum! I’ve been wanting to cook chili forever really! This is awesome, you made it look sooo easy to cook. Thanks a lot. My daughter has just moved out for the first time and she tells me that she and her roommates are huge fans of single-pot meals like curries. I’ll be suggesting this chilli to her. They could whip up a whole bunch at the beginning of the day and then have leftovers. 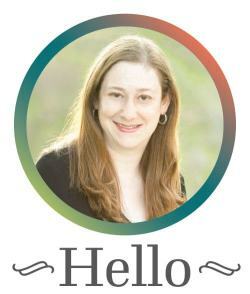 Plus, she is a die-hard fan of beans. Chili is one of my favorite things to make. I love setting up the crockpot with some dump and go chili only to come home to it hours later. Nothing better! I always make my chili in the slow cooker. It’s the best way to marry all the flavors into one magical chili experience.